Engineering student, musician, entrepreneur and philanthropist Andrew Forde (MSE 1T1, IndE PhD candidate) strives to challenge the status quo with his projects. Now, the multi-talented artist is debuting a new musical composition he designed to reflect modern Canada. Called The Ideas of North, the concert will be performed on Friday, February 9th at Koerner Hall. Inspired by Glenn Gould’s 1967 CBC radio broadcast The Idea of North, Forde heard within that broadcast a project about embracing something classic and wrapping it in a modern quilt of voices and instrumentation. Half a century later, Forde recognized that many of the original themes were still relevant to contemporary Canada. Forde began composing The Ideas of North nine months ago, and conceived of the work as unfolding in three parts, like a concerto. He reached out to friend and Juno-winning musician and performance artist Shad to write the lyrics. Born and raised in Toronto to parents who arrived from the Caribbean, Forde grew up immersed in the city’s multiculturalism. 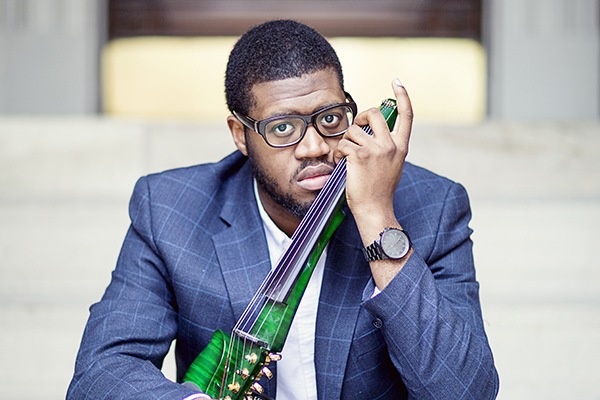 He started studying violin as a child, a passion he maintained throughout his studies in U of T Engineering. This balance between arts and engineering strengthened both abilities, he says — the rigor and wonder he found in engineering influenced his music, and the creativity of his compositions enriched his engineering design thinking. This multi-faceted approach, along with Gould’s initial work, led to the creation of The Ideas of North. The performance is collaborative, interactive and communicates a responsibility to shift consciousness, to instigate conversation, and to have safe opportunities to reconcile differences, says Forde. When he takes to the Koerner Hall stage on Feb. 9, 2018, he will bring Iskwé, an Indigenous singer-songwriter, and teenage trumpeter and pianist William Leathers, along with Shad who will appear digitally. Tickets for The Ideas of North are available online and through The Royal Conservatory of Music.